A recent trip to Imperial Beach, California revealed that it is not the greatest sightseeing attraction – and that’s how the locals like it. 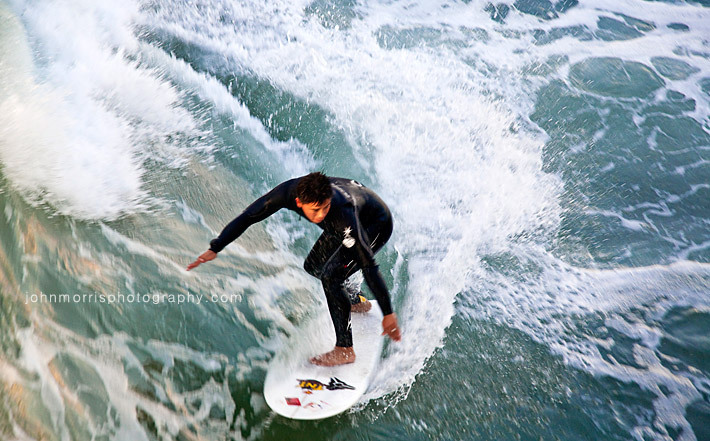 Imperial Beach is a low-key beach community that’s great for surfing and fishing. The beach itself is small and relatively unkempt compared to others in the area. A lifeguard patrols the beach in his truck leaving tire tracks behind in the sand. But the waves are consistently large and surfers flock here by the dozen every day in hopes of catching “the big wave”. There’s a history here. As long as there has been surfing, there’s been the quest for the biggest wave and the longest ride. According to the City of I.B., the number of California surfers grew from under 70 to over 1500 between 1930 and 1950. In the 1940’s surfers from all over Southern California made the journey to what is now Imperial Beach to surf the then-known biggest waves off the continental United States. In the 1980′s, surfing in California hit the tipping point and since then Imperial Beach has been a favorite spot for many surfers. Watching the surfers was truly remarkable. I really give these guys a lot of credit for going out there every day and doing their thing. After spending a day observing the surfers, it makes me want to give it a try. On a side note, we even spotted a family of whales passing by in the distance.